Provencale is a style with an overall pattern that was inspired by the hand-painted art on antique pottery found throughout Mediterranean Europe, especially in the region of Provence, France. Our finds from Roussillon and Avignon specifically inspired the art on this style. Scrolls, fleurs-de-lis, florals, vines, and other stylized art motifs are arranged into a pleasing pattern across the surface of Provencale. The prominent coquille shell and long-gowned feminine figure standing above it is the focal point of the art. The main color is bold, with a contrasting accent color that appears in small spot art on most items. The main font, a classic condensed serif face, is set in a box of solid color, bordered by bands of contrasting color. The accent font is a similar but non-condensed serif font that is easy to read at small point sizes. Customize your Provencale bridal shower coasters today to add a unique touch to your bridal shower! Provencale Bridal shower coasters are available in multiple shapes—3.9" round, 3.9" square with rounded corners, and others. They are extra-thick, 58-point paper board. To give you an idea of how thick they are, a stack of a dozen coasters is about 3/4" tall. They are made of absorbent pulpboard to help protect your tabletop. The coaster surface is coated with a smooth matte coating to provide beautiful, crisp printing. 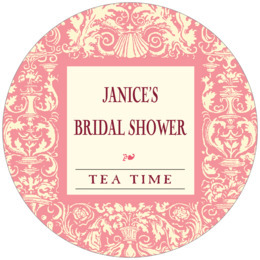 Bridal shower coasters are individually die-cut, so their top has a soft and rounded edge. They are designed to be disposable, but they are durable and re-usable. If unused, they can be kept as keepsakes and will last forever. 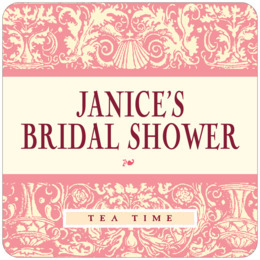 Bridal shower coasters are printed on one side only. On the blank back, a small Evermine logo is tastefully debossed (not printed with ink, but simply pressed into the soft pulpboard paper). Provencale bridal shower coasters come beautifully packaged in boxed sets of a dozen.